Deputies arrested 60-year-old Manuel Fernandez for being a felon in possession of firearms and ammunition. 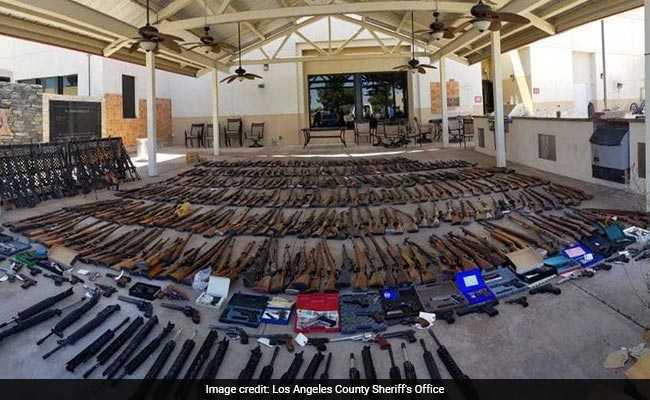 The tip that came into the Los Angeles County Sheriff's Department was simple: Someone suspected that a felon in Southern California was illegally in possession of "a large arsenal of firearms." What, exactly, constituted a large arsenal in this case? Sheriff's deputies soon discovered the answer. Early in the morning on Thursday, a team of investigators arrived at a home in Agua Dulce, an unincorporated area about 20 miles northeast of Santa Clarita, and searched the property. From there, they seized 432 guns. Deputies also arrested 60-year-old Manuel Fernandez for being a felon in possession of firearms and ammunition. But the trove of guns inside that home in Agua Dulce was just part of Fernandez's stash, authorities said. As they searched the first residence, investigators obtained a second search warrant for another home about a mile away. There, deputies seized 30 more guns that illegally belonged to someone the sheriff's department described only as "a female associate." Charges against the woman are pending, officials said. Finally, investigators returned to the first house. Sweeping the home again, deputies found and took 91 more guns hidden throughout the house - as well as computers, cellphones and hard drives they suspected had been involved in illegal gun purchases. In total, deputies seized 553 guns - rifles, shotguns and pistols - from Fernandez and his associate, authorities said. 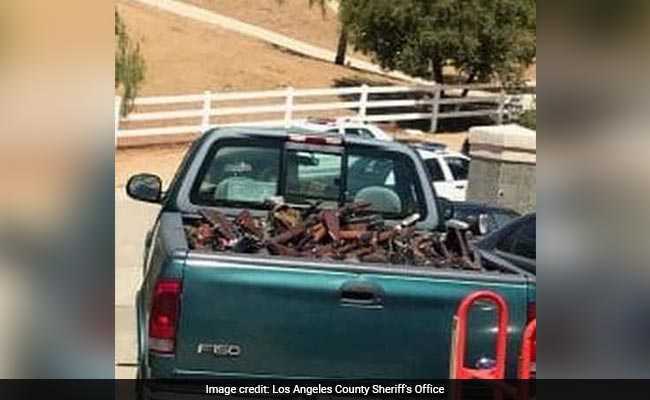 Photos of the haul released by the sheriff's department show the firearms piled into the bed of a Ford pickup, then laid out in neat rows that covered just about the entire patio at a local sheriff's station. "This case is a testament to the community's involvement in reducing crime and taking guns out of the hands of criminals," Los Angeles County Sheriff Jim McDonnell said in a statement. He credited the department's "See Something, Say Something" campaign with helping elicit the tip. "A separate Harvard-Northeastern study published in 2016 found that 3 percent of American adults (individuals in this case, not households) own half the nation's firearms. Combined with the latest Small Arms Survey estimate, that would mean that 3 percent of American adults own nearly one-quarter of the world's civilian firearms stockpile. It's worth noting, however, that the Harvard-Northeastern study, which was based on a survey of gun owners, estimated a much lower number of guns in circulation: 265 million as of January 2015." The Los Angeles County Sheriff's Department did not immediately respond to questions about what would happen to the guns seized in Agua Dulce this week, or whether Fernandez possessed any weapons that would have been illegal regardless of his felony conviction. Fernandez was charged with being a felon in possession of firearms, an assault rifle, ammunition and large-capacity magazines. He is out of jail on bond and next scheduled to appear in court on July 9.